I really like this! It's very pigmented, lasts for a long time and has a pretty luminosity. This is a solid drugstore dupe for Hourglass' Ambient Lighting Blush. This gives my skin such a radiant, rosy glow. It applies easily, stays on all day, and the price is right. Plus it's pretty to look at. I would totally purchase this and recommend it. 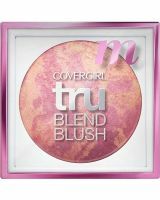 A great dupe for the Hourglass Lighting Blush. Grogeous pigment, pretty packaging. Impressed.